From 11/28/15 notes. 750ml bottle into a tulip. Pours a great looking reddish-purple color with purple head and moderate carbonation evident. Tons of sour blueberries, tart dark fruits, oak, spices, light funk, acidic, vinegar. Medium body and moderate to high carbonation. Overall a great smell and look. Taste is lighter, but a very good beer. Another winner from de Garde. The aroma hits of tart Warheads, blueberry. 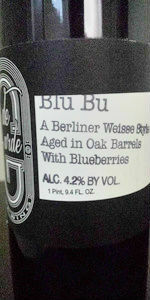 The flavor follows with medium tart, blueberry candy, blueberry peel, and a familiar Berliner sharpness of tart flavors. 750 mL bottle poured into a nonic pint glass. Great fruit character and a good mid-Sunday beer if you are planning lots of new beers for New Beer Sunday.